Enjoy - Food & Travel: The Slammer - a real hit!! I fell for the Big House The Slammer Syrah 2006 due to its funny label, and from the fact that I love wines made from Syrah grapes. The Big House Wine Co, it produces a wide range of wines from different grapes. Winemaker Georgetta Dane's goal is to produce wine and wine labels that "will scintillate the most jaded imbiber." Our Soledad Winery in Monterey County, is a mere ankle iron’s toss from the Soledad State Correctional Facility, aka The Clink, The Slammer, The Hoosegow, The Cooler. 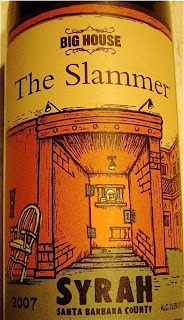 The Slammer Syrah 2006 is made from 85% Syrah and 15% Petite Sirah grapes and is recommended to beef, lamb, pork and game. This is a full bodied Syrah, with a dark ruby, blue-red colour, and rich fruit aromas from dark berries and spices, and a hint of camphor. Though a great wine, it may, in my opinion struggle to match some game meats.